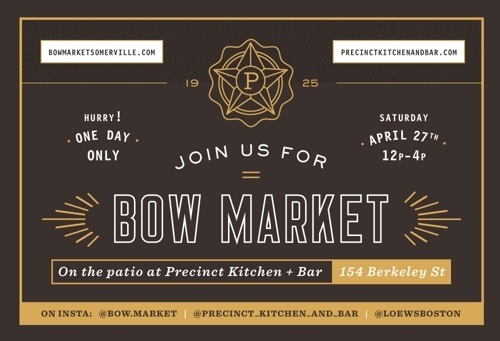 Somerville’s popular Bow Market comes to Precinct’s patio for one day only! Blue Bandana Relics, a curated collection of vintage Americana and quality American brands. Buenas, all sorts of South American goodness you can eat on the spot or take home to use in your own recipes. Think: take-n-bake empanadas, pastry dough to make your own empanadas (and other stuff), and sauces you can use for everything from roasting chicken and salmon, to topping oysters. Maca, chic and cheeky, regular and character macarons that range in flavors from vanilla to blueberry basil cheesecake. Peston, unique accessories, fleeky home goods and apparel. Happy Cactus, succulents, cacti, air plants, exotic plants, ethically sourced butterflies, crystals, gems, fossils and pretty much anything extraordinary Mother Nature creates. Additionally, guests will also enjoy soaps and creams from the Sentas Family Farm and much, more! Precinct will be serving their regular breakfast, brunch and lunch menus all day long, so reserve your table and head over! © 2019 The Back Bay Association | Design and Implementation by Miele-Fleury Graphics & Ashdown Technologies, Inc.